One of the more interesting toy lines to come out in 2013 was the Adventure Wheels Duck Dynasty Action Figure line, made by Tree House Kids. Released as four individually carded 3¾” scale figures in June 2013, in what is apparently a U.S. Walmart exclusive, the set flew under the radar of most collectors and fans of the show. Adult collectors tend to avoid similar “budget” lines, such as Chap Mei’s offerings, or the many non-licensed lines that Toys R us and Walmart offer. So the surprise release of these toys, combined with the huge popularity of the show, has made these slightly difficult to obtain this summer. Meet the Robertsons, a Louisiana bayou family living the American dream as they operate a thriving business while staying true to their family values and lifestyle. Their thriving business is a multi-million duck call company. Their lifestyle is a bizarre combination of southern redneck culture with new money backing. Exploding things, their uncle’s impressive malapropisms rivaling the great Yogi Berra, the killing of snakes, and bearded hijinks are all regular staples. It’s a hilariously fun show, and in many ways both plays into, and transcends regional stereotypes. It definitely inspires strong opinions in many, both for and against; but that’s not what we’re here to talk about. You want to know whether it’s worth it to trudge the lonely wastelands of Walmart to find these tiny commanders of ducks. 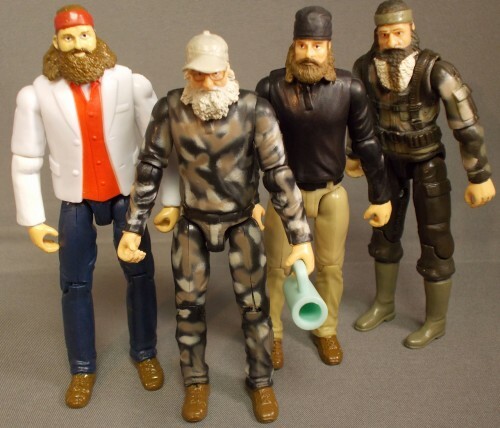 I had to drive to several stores to get the full set of four: Willie, Phil, Jace, and Si. That’s the first time I’ve had to do that in a while (I buy online a lot.) Si is most definitely the most difficult to find, not surprising as he is the breakout character from the show, while Willie is the easiest. The figures sell for about US$5 each at retail, and around $20 for the set of four, a great deal in today’s market. Packaging: The figures come individually carded in a sturdy, small package. The cardbacks are identical, except for the barcodes: they appear to be unique for each character. The figures are displayed cleanly in the bubble, as well as all the gear they come with. They’re reasonably cool in the package, but if you’re not interested in funky, weird, cheap figures, you’ll be best served by stopping here. Sculpt: The sculpts on these figures are definitely in the lower-end of what is available on the market today in this scale, but actually quite nice when compared to other Walmart figures. Hands down, the best likeness is Willie. He looks mostly like you’d expect a toy of Willie to look, with his white blazer and headband. Si and Jace are pretty good as well, but Phil is pretty generic, and is somewhat unrecognizable. It looks like the only figures that share parts are Jace, Willie, and Si, as they all have the same upper thigh parts; Jace and Si share shins/feet as well. Phil seems to have all unique parts. The figures are sculpted at different heights to match the men’s sizes in real life, a pleasant surprise. Another pleasant surprise was that the figures have foot peg holes for use with display stands. They seem to be a hair bigger than the standard 1980’s G.I. Joe stand peg, so they won’t firmly attach, but some blue tack fixes that easily. Paint: For the price of these figures, the paint work is overall really good, and quite a bit cleaner than similarly priced products. Willie had quite a bit of paint loss at the elbows, as the joints were painted over, and simply bending them caused the paint to rub and crack off. This is minor, as the elbow joints were molded in white anyway. 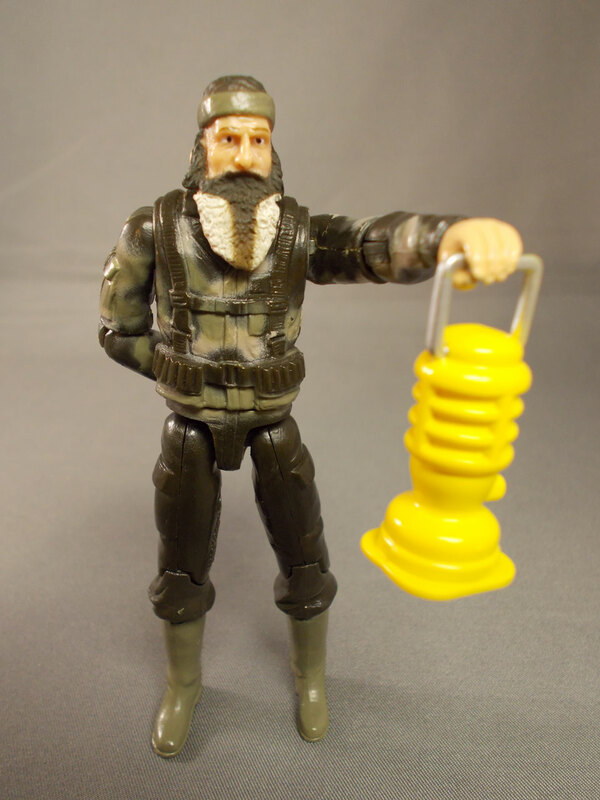 Articulation: If you’ve handled a vintage 1980s G.I. 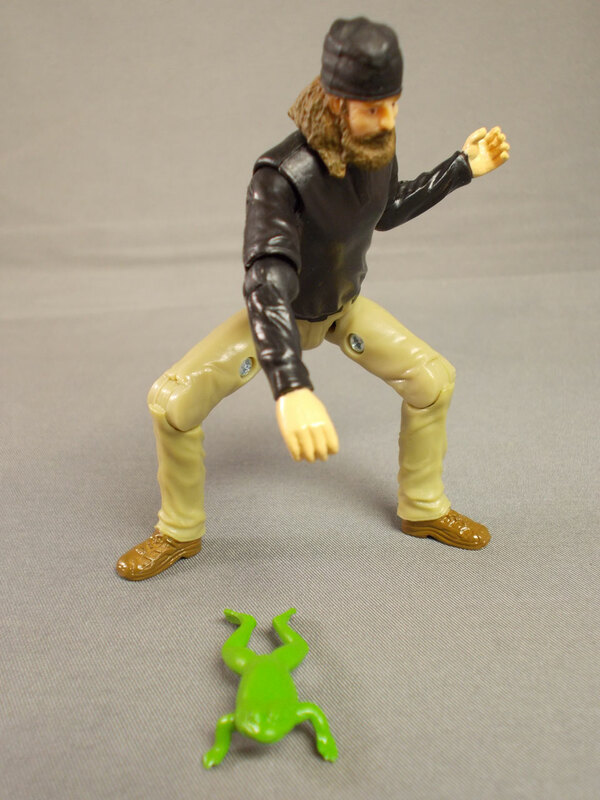 Joe figure, or one of the 3¾” figures from the 2009 Star Trek line, you’ll have an idea of how these guys can move. Each of the figures has a swivel head, ball shoulders, ball elbows, swivel waist, T-Bar hips, and hinge knees. Si and Phil had incredibly stiff elbows, so stiff that when I tried to bend them, I was afraid I’d break them. While they have quite a bit of articulation for the price, all of the points felt very cheap and that with repeated heavy use, they would break. Accessories: All of the figures come with a bunch of accessories, and they’re very fun. I was surprised that they came with anything at the price. 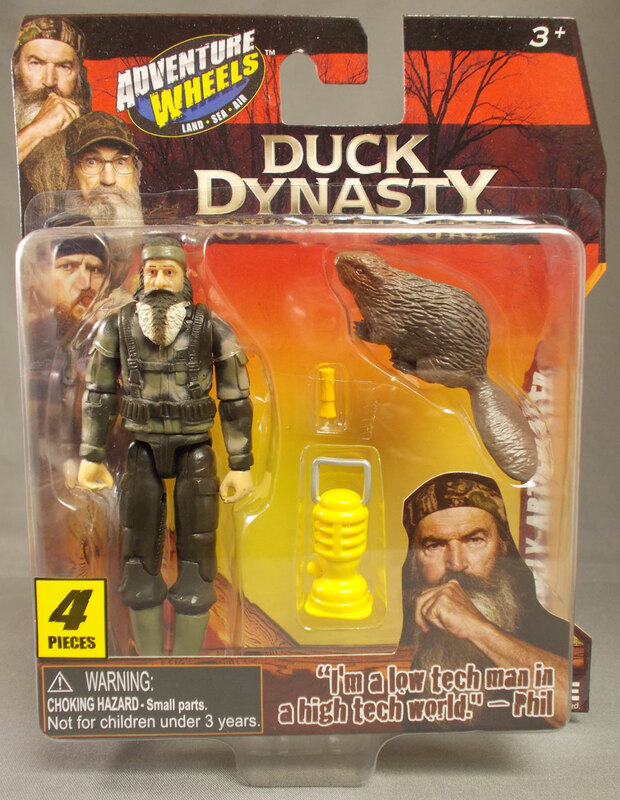 All four come with a small orange duck call, of course. 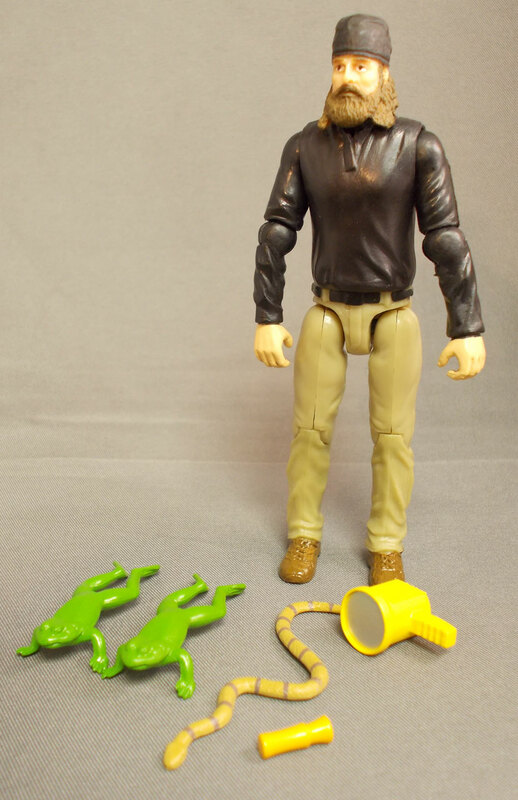 Jase comes with two frogs, a searchlight, and a snake; Phil has a beaver and a lantern. 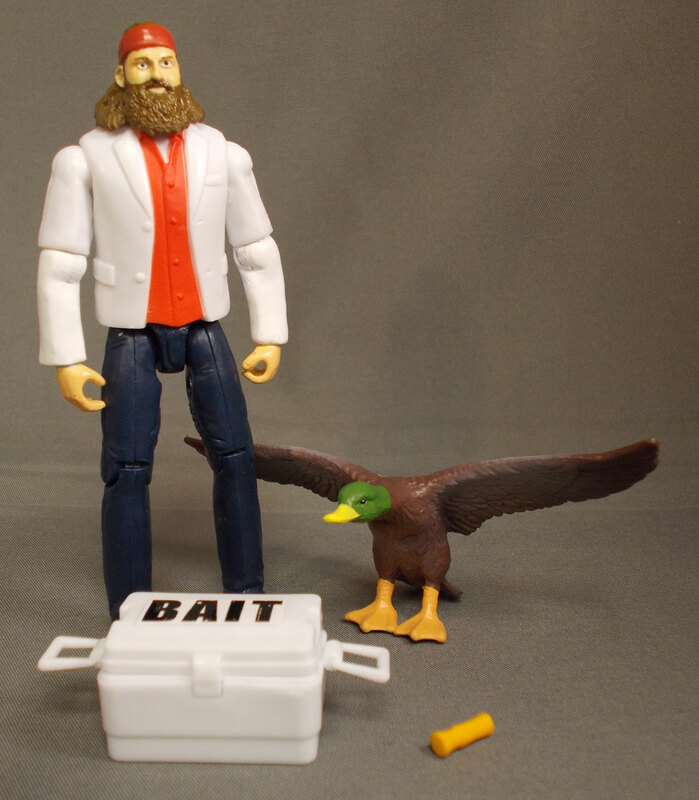 Willie includes a duck, and a white cooler that says “BAIT” in huge letters; Si comes with probably the strangest load out: his plastic cup and an oversized squirrel. 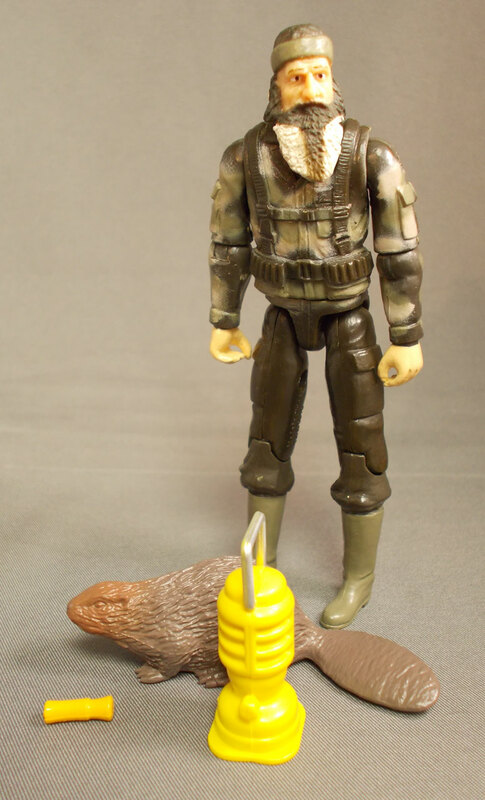 Fans of the show know Si is inseparable from his unsweetened ice tea pitcher and the plastic cup his mother sent him while he was serving in Vietnam, but there’s something surreal about giving him a giant squirrel to hunt. The animals are way out of scale, but that just adds to the goofiness of the whole set. I was really impressed by the quality and quantity of the accessories, especially for the price. Strangely, none of the figures included a firearm. These guys are hunters, they should have some type of a weapon. I gave them some extra weapons from the parts bin, so they are now properly armed. Most 3¾” accessories will fit into their hands, but due to the sculpt, they can’t hold a rifle well with both hands, limiting their ability to decimate snakes at point blank range with large shotguns. Quality Control: Here is where the figures fall a bit flat, literally. I had a very hard time getting any of the figures to stand straight up, as the hips were all quite loose. That is the smallest problem with these figures though. Phil Robertson is actually the worst, with two left forearms and a bent-up left foot. Willie’s paint chipping at the elbows is forgettable compared to Phil’s figure’s issues. He can barely stand. He has two left hands. But for some reason it doesn’t get me worked up like it would on another line. Since these figures were essentially half the price of other similarly-scaled toys, can you truly hold them to the same standard as some of the Marvel or Star Wars figures, which are $10 each? Somewhat. They look much better than similar budget figures, but are lower quality than offerings from Hasbro or Mattel. 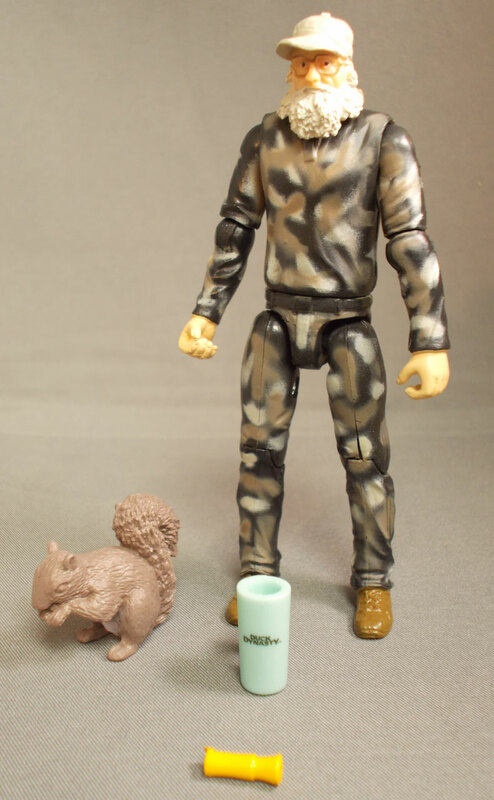 If I had any one of these issues on say a Masters figure, I’d be irate and quickly send it back. The lower price point makes me far more understanding of QC issues like these reversed limbs or chipping paint. Overall: For $20, these four guys are pretty cool. When you start comparing them individually to something like a modern Star Wars figure, they fall flat. They’re just not as high quality as the other mainstream lines. The scale allows them to be displayed with over thirty years of different toys, which is a huge plus. I could see a kid enjoying these figures as generic thugs if they don’t know the show. I can’t help but feel that children might have a similar experience to what I had in the ’80s with the Love Boat toyline from Mego: since they don’t know the show, the figures become random villains or (in the case of my Love Boat toys as a kid) kidnapping victims of the bad guys. Just make sure you tie up Uncle Si with his cup, kids. If you’re a fan of the show, if you keep your expectations low, and realize this is not an adult collector line, then you’ll enjoy these toys. For action figure fans that don’t know or care about the program, I’d be very cautious. As playthings they’re functional. As collector’s items, they’re so-so. As funny little guys to use to beat up your Stormtroopers in pictures for Facebook or Flickr, they’re great. Make no mistake; these are not good, high quality figures. They’re fun, goofy, and in the brief time they’ve been in my house, brought a bunch of smiles. The license is what makes these more fun than they should be. They are cheap and enjoyable for what they are, and sometimes, that’s more than worth the price of admission. RZ aka Rich Zilg, is a musician, producer, and writer who has been collecting toys, comics, and other pop culture memorabilia since the mid-90's. 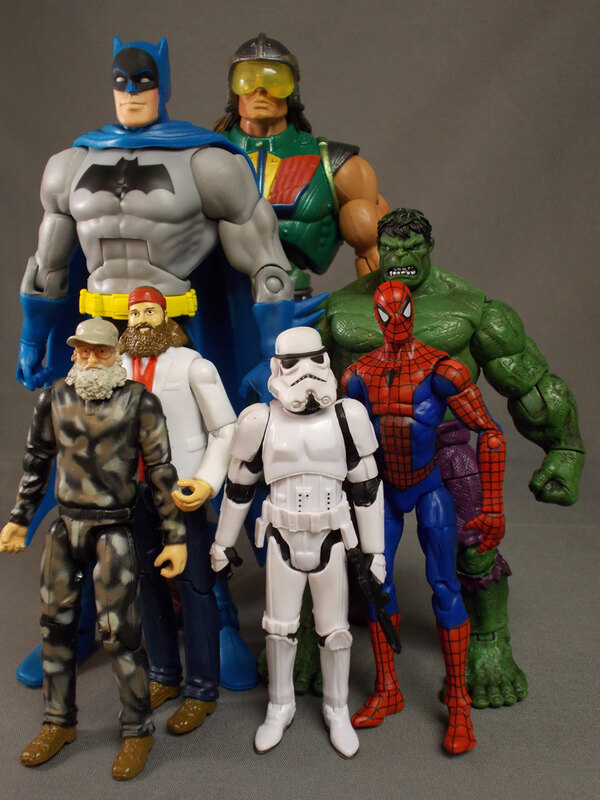 After years of neglecting to document his collection, he's recently started in earnest with The 3.75 Inch Action Figure Museum, which can be viewed at 375inchactionfigures.blogspot.com. Interesting. They remind me of a lot of the oddball stuff from the 80s, like your Love Boat figures, or the A-Team line. Just looking at the pictures, I'd say Jace and Si are exactly the same from the neck down, but 3 different sculpts out of 4 figures is still pretty good. Beats most Mattel lines. They are just nutty. 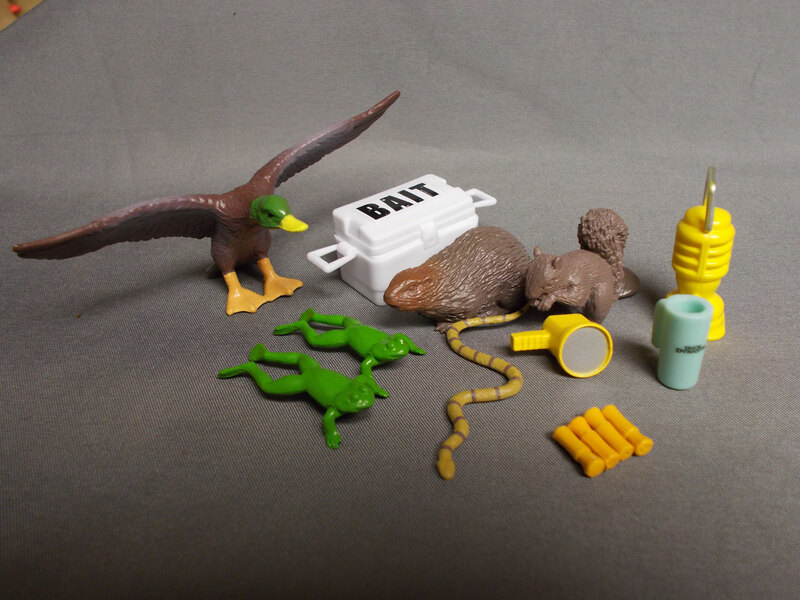 The duck is just so huge and great, and the BAIT cooler is awesome and silly too. It's funny they put BAIT on it as big as possible, to prevent kids from ever thinking there was beer in there… I've been fishing all my life, and even though I'm not that good I don't need a whole giant cooler full of BAIT. I did discover after I wrote this, that many of these accessories are reused from other past Adventure Wheels sets. Maybe Bait is actually B.A.I.T.